The English Springer Spaniel is a medium-sized, outgoing, and attractive dog with a strong sense of fun and a deep-seated devotion to its human family. This multi-purpose breed is a good choice as a companion gundog, as a field trial or show prospect, and, most importantly, as a life-long friend. Spaniels are ancient dogs that have been used for flushing and retrieving game for centuries. The spaniel-type dog probably originated in Spain, and may have been introduced to the British Isles by the invading Roman armies. Over time, British hunters developed distinctive lines of spaniels suited for the game and terrain of the island. The smaller dogs in these spaniel litters were used for hunting woodcock, and became known as Cocker Spaniels. The larger littermates were used to "spring," or flush, game birds, and were dubbed Springer Spaniels. Eventually the Springer Spaniels were further distinguished by colour, with the English Springer Spaniel being usually liver and white or black and white (or tri-colour - with tan points), and the Welsh Springer Spaniel being always red and white. The English Springer Spaniel was brought over to North America in the early 1900's, and the first ESS was registered by the AKC in 1910. In these early years, the ESS excelled at both field trials and conformation shows. Many dogs spent one day at a field trial and the next day in the show ring, with impressive results in both venues. Today's competitive Springer usually participates either in field trials or in the show ring, but not in both. Field and show interests often come together, however, at Spaniel Hunting Tests, an increasingly popular venue in which to display the breed's beauty and versatility. Any well-bred Springer should have the temperament of a good hunter-eager to please, quick to learn, and willing to obey. A hunting Springer at work in heavy upland cover is an amazing sight. When the dog catches the scent of a bird, he accelerates toward the bird to launch it in the air, then "springs" to force the bird higher. He then waits for his master's call to retrieve. Throughout this series of events the dog must be attentive not only to the game, but also to his master's instructions and the actions and positions of other dogs and hunters. A successful hunting companion needs a good nose, a soft mouth, the drive to find game and a desire to please his master. All these characteristics can be found in the English Springer Spaniel. The breed's appearance reflects its original purpose. A hunting dog has to be able to cover a lot of ground without tiring; therefore, the Springer is medium-sized, compactly built, and well-muscled, with a smooth, effortless, ground-covering stride. 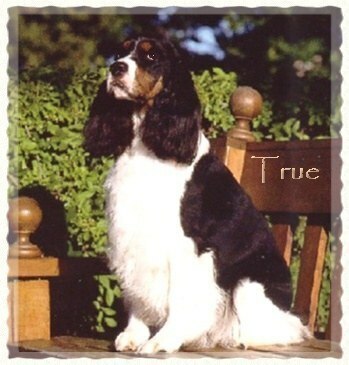 The Springer has a soft, dense undercoat and a longer outer coat that is firm yet never coarse. These two coat textures combine to protect the Springer from thorns, water, and bad weather. The Springer has a docked-and very expressive-tail, and is usually liver and white, black and white, or tri-colour. Springers may be liberally flecked with ticking, or spots. All have a friendly, gentle expression with the deep, "soulful" eyes of the typical spaniel. The variations between those Springers bred primarily for field trials and those bred primarily for conformation should be considered by prospective owners, even if the dog is not acquired with competition in mind. Field bred Springers tend to need more exercise and activity than show bred dogs; on the other hand, show bred Springers tend to require more grooming. However, either can make a wonderful companion for the right family. The English Springer Spaniel is friendly, active, and trainable. The Springer likes to be in the middle of all family activities, and will not be content to be left out, or left alone, for long periods of time. He is a curious dog who will announce the arrival of company, but will welcome almost any guest as a friend. He enjoys long walks and games of fetch and Frisbee, and can be very gentle with and tolerant of children. Although a Springer's need for exercise should not be underestimated, it is a good breed for both country and city life. In short, the English Springer Spaniel is a remarkable animal whose characteristics explain the longevity of the spaniel-type dog. Throughout history, spaniels have provided help in the field, company in the home, and loyalty at all times-all with a generous spirit and a happy disposition. What more could we ask of a dog? The trainability required for a Springer to excel as a hunter makes the breed a standout in other performance events as well. As this table shows, Springers have earned many titles in Hunting Tests, Obedience, Tracking, and Agility.